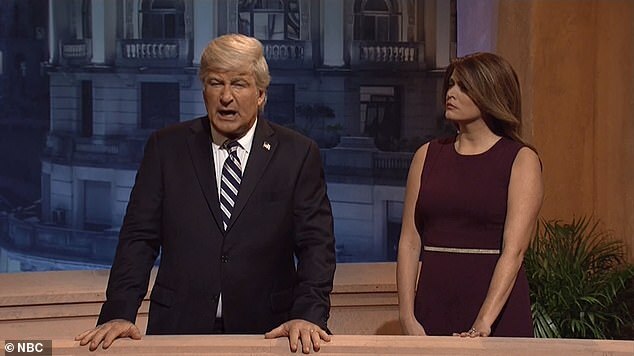 Alec Baldwin reprised his role as President Donald Trump on Saturday Night Live – the second time this season that the actor has played the Commander in Chief. Baldwin had been on a long hiatus, during which he was arrested near his New York City home after getting into an argument with another driver over a parking spot. ‘God, I haven’t been this upset since I freaked out about that parking space,’ Baldwin says while in character. The Long Island native poked fun at himself during Saturday’s cold open, in which ‘Trump’ is seen on a balcony in Buenos Aires, where he is staying for the G-20 Summit. Trump is joined on the balcony by First Lady Melania Trump, played by Cecily Strong; his lawyer, Rudy Giuliani, who is portrayed by cast member Kate McKinnon; Russian President Vladimir Putin, who is played by Beck Bennett; and Saudi Crown Prince Mohammed bin Salman, who is played by SNL alum Fred Armisen. The opening skit also featured a cameo by Ben Stiller, who played Trump’s former fixer, Michael Cohen. The First Lady comes out to console her husband, who appears preoccupied. ‘Donald, come to bed,’ the First Lady says. ‘Melania, I’m having trouble sleeping,’ the President says. In real life, Melania Trump is in charge of decorating the White House for the holiday season. ‘What’s the matter, Donald, do you not like Argentina?’ the fake Melania asks. ‘No, I love Argentina,’ Baldwin’s Trump says. That line is a reference to Argentina historically being a haven for Nazi war criminals who fled to the South American country after the fall of the Third Reich in 1945. ‘I just can’t stop thinking about this Mueller investigation,’ Trump says. In real life, the Mueller investigation has netted a litany of indictments against senior officials who worked for Trump in his private life as well as during the campaign, chief among them Michael Cohen, his former lawyer and fixer, and Paul Manafort, who once chaired his campaign. ‘Oh, cheer up, Donald! You know worst case scenario, you go to prison and you have to transfer your money to me for safe keeping and I have hire a giant man to protect me,’ Melania says. The President then says to himself: ‘Oh, Donnie, you’ve really done it this time. ‘You have to face all of those European leaders again. Giuliani, played by McKinnon, makes an entrance. ‘Rudy, where did you come from?’ Trump asks. ‘Oh, I was hanging upside down under the balcony,’ he says. ‘What’s the latest on the Mueller probe?’ the President asks his attorney. ‘Well, the good news is it’s almost over,’ Giuliani replies. ‘And the bad news?’ Trump asks. ‘Well, I’m involved, so it’s not great,’ Giuliani says. To which Giuliani replies: ‘Yep, and I keep those secrets where no one can find them, on nationally televised interviews. When Giuliani leaves, Trump complains about being abandoned. ‘No one understands me,’ the President says. Stiller then enters the frame as Cohen, who in real life struck a plea deal with Mueller in which he divulged information about Trump’s alleged business ties to Russia. ‘Yes, hello? Michael Cohen speaking. I’ll tell you anything you want,’ Cohen says. ‘Michael, Michael, it’s Donald,’ the President says. ‘Mr. Trump, I’m not supposed to be talking to you,’ Cohen says. ‘Come on, Michael,’ Trump says. ‘Okay, fine, I can’t say no to my Donald trump-lupus,’ Cohen says. ‘I’m not sure it will work, sir,’ Cohen says. ‘Trust me, Eric will never catch on,’ the President says. ‘Sorry, Mr. Trump, it’s over,’ Cohen says. ‘They got them on tape,’ Cohen says. ‘Our vacations to Moscow,’ the President says. ‘What about our hairstylist, the blind man with the shaky hands?’ Trump says. ‘Then why did you make me do so many illegal stuff?’ Cohen asks. ‘Because you’re like a son to me,’ Trump says. Putin, played by Bennett, then walks onto the balcony. He is customarily shirtless while wearing a necklace with a cross. ‘Donnie, why are you still up? Come back to bed, babe,’ Putin says. ‘I can’t believe you and the crown prince of Saudi Arabia had that whole handshake yesterday,’ Trump says. In real life, Putin was seen greeting Crown Prince Mohammed bin Salman with a friendly handshake while Trump was seen looking on. The photo spawned internet memes portraying Trump as jealous of the Russian leader’s friendship with the Saudi royal. ‘What, that?’ Putin says in the cold open. The Saudi crown prince, played by Armisen, then walks onto the balcony. ‘Hey, Vladi Daddy!’ the Saudi royal says. ‘I thought I was your number one,’ Trump says. To which Putin replies: ‘Oh, totally. You’re not my side piece. ‘Yeah,’ the Saudi royal said. ‘And I was like did you really kill that journalist?’ Putin said. The line about killing the journalist is a reference to Jamal Khashoggi, the Saudi national who wrote a column for The Washington Post. Khashoggi was reported to have been brutally murdered in the Saudi consulate in Istanbul – allegedly on the orders of Mohammed bin Salman. To which the Russian leader replied: ‘Oh, it’s all right. ‘Hey, when am I moving into Trump Tower penthouse in Moscow? In real life, one of the revelations made by Cohen in court this past week was that Trump associates were negotiating with senior Russian officials close to Putin about building a Trump Tower in Moscow during the election campaign. It was even reported that Trump offered Putin the $50million penthouse. ‘You’re so funny, Vlad,’ Trump says. The Saudi crown prince interjected. In real life, the Trump administration said it wants to maintain relations with Saudi Arabia and that it would not jeopardize those ties over the Khashoggi killing. Putin and the Saudi royal then do a male-bonding type handshake. Both Putin and the Saudi royal then exit the scene, with the Russian President saying: ‘Anyway, you won’t see me for a while, Donnie. Trump then breaks out into a song, changing the lyrics to Don’t Cry For Me Argentina, the song made famous by the musical Evita. ‘Don’t cry for me Argentina, the truth I’m very guilty. some little no-nos, and maybe treason, but I kept my promise – oops, no, I didn’t,’ Trump sings. Trump is then joined in the song by all of the other characters.